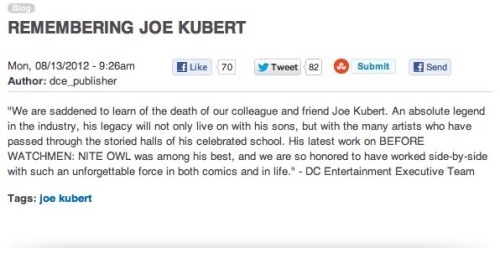 Legendary comic book artists Joe Kubert passed away yesterday, but DC caused an outcry when they plugged their title Before Watchmen: Nite Owl in his obituary. The founder of The Kubert School of art, famous for his work on Hawkman, Sgt. Rock and Enemy Ace, had much of his repertoire ignored by the obituary, instead focusing on Nite Owl which was "among his best". After a backlash from fans and comic professionals, DC revised the piece by adding more information about characters he worked on. Kubert won the Eisner and Harvey Awards in 1997 for Fax from Sarajevo. His sons, Andy and Adam are both successful comic book artists.